No one prints and signs documents anymore. 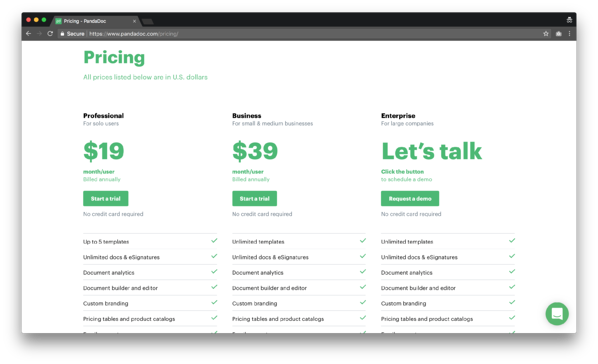 In this episode of Pricing Page Teardown, we are bringing you not one, but two pricing pages. We square the incumbent, DocuSign, up against the insurgent, PandaDoc, to show how these two companies in the same space, but at different stages of growth, are thinking about pricing. DocuSign has filed for a $100 million IPO with revenues up 36% in 2017 to $518 million. It is rapidly expanding away from just offering eSignatures to offering payment options and managing the entire lifecycle of your documentation. This has left room for new kids on the block such as PandaDoc. Started in 2013, the company now has 8,000 customers and is growing with the help of a $15 million Series B round in 2017, which included investment from Microsoft and HubSpot. Let's put these pricing pages up against each other and show how both could be getting more of this growing market. “Choose the #1 eSignature solution” and “send documents for signature” show that DocuSign wants to push you towards them as the leader in the space. This makes sense—they are the leader in the space. Though they have added that great word “basic.” The actual pricing has changed slightly, as have the names of the tiers, but you wouldn't be able to tell if you were on the 2014 page or the 2018 page at a glance. 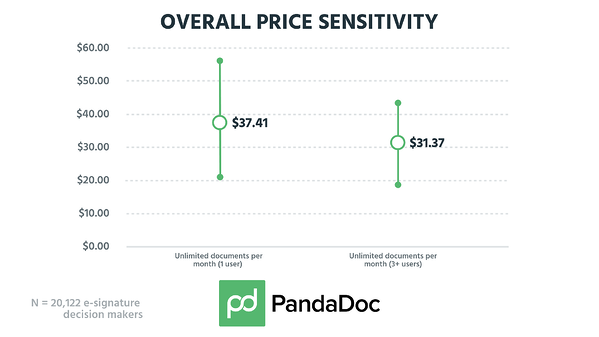 PandaDoc is outcome-based pricing. 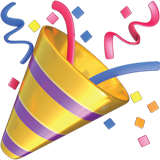 All plans offer unlimited documents and signatures. Instead, they concentrate on how PandaDoc can make the user's life easier with document templates and analytics. They are saying to their customers that the signature is just a function of what you really want to do, which is share and understand great documents. PandaDoc wants to make sure any prospective user understands that. At the higher end, they are leaving ARPU on the table. For unlimited documents, the willingness to pay is as high as almost $70 per month for one user, and $60 for 3+ users. The medians are lower at approximately $45, but DocuSign's pricing is lower than this. Their Standard plan is just $25, while their Business Pro plan is $40. 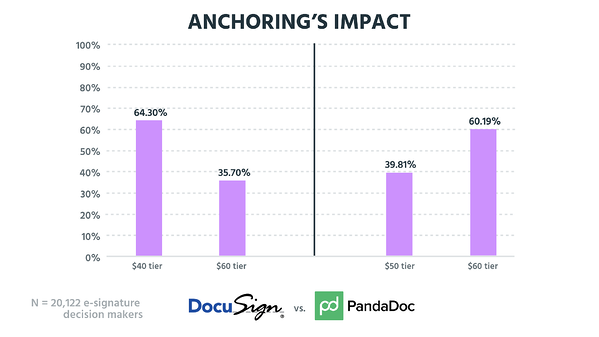 To take more advantage of the fact that customers are willing to pay more, DocuSign should make better use of the anchoring bias. The anchoring bias is our tendency to latch on to the first piece of information we come across and use that as the reference for all other decisions. In pricing, this usually means we focus on the lowest price and use that to evaluate other prices. 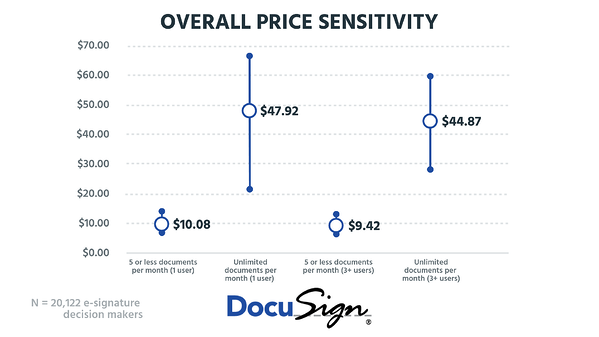 For DocuSign, there is a 4X increase between the lowest price and the highest price. 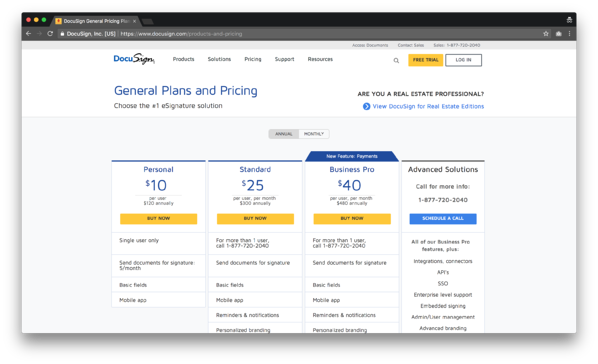 A customer evaluating this pricing page isn't just looking at the features of the Business Pro plan and deciding based on that information. Instead, they are looking at the Personal plan and wondering if the Business Pro is worth 4X as much. When the jump was $20, 64.3% chose the cheaper plan. When the jump was $10, 60.19% chose the more expensive $60 plan. The anchor in the second version wasn't so far away, so the shift seemed more logical. 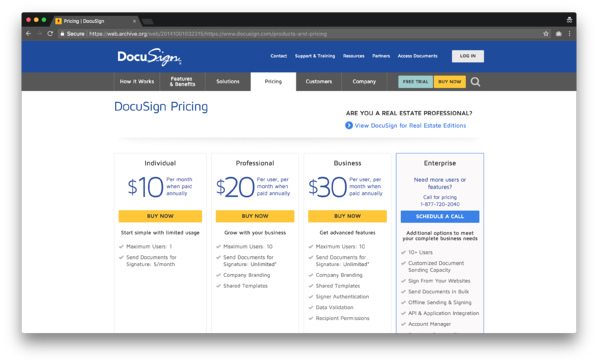 If DocuSign's pricing was $10 (as this is spot on), $35, and $45 for the Personal, Standard, and Business Pro plans respectively, they could increase ARPU with a marginal hit on leads coming through the door. The willingness to pay is lower overall due to branding but they are still widely underpriced. 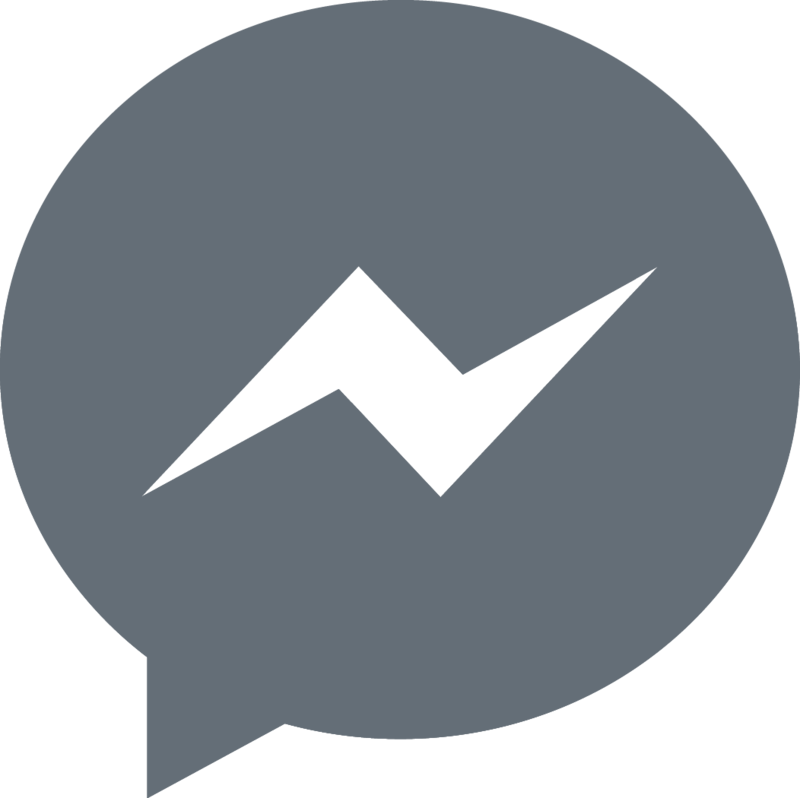 They could charge $10 more per user per month and still retain their conversion rates. Likely, they have lowered their pricing to increase acquisition. Instead, they could be using freemium. Freemium is for acquisition rather than revenue, so it is ideal here for allowing PandaDoc to use it to get leads through the door and free up their pricing for monetization. This approach will require more work in terms of filtering out bad leads, but that should be paid for by the increase in ARPU through monetizing the best leads better. In their own ways, both PandaDoc and DocuSign are doing a great pricing job. DocuSign knows what its customers want to pay and PandaDoc knows how to appeal to its customers. In their own ways, both PandaDoc and DocuSign could improve their pricing strategies. DocuSign needs to think about anchoring and PandaDoc needs to think about freemium. We use DocuSign, but PandaDoc is making us think again. As a pricing company, we should support companies that think a lot about their pricing strategy. What PandaDoc is doing isn't perfect, but they know that outcome is going to win long term. Which technology you have is no longer enough. Pricing and SaaS isn't about function anymore—it is about the outcome.